I would imagine that kid refers to kidskin, or leather made from goats - usually the kids. It would be very soft and strong, normally used for purses and womens shoes. Stitching with the polyester sewing thread gives it a really interesting looking texture with the way the threads keep to themselves but still form the stitch (I hope you understand what I mean). I've never used it for embroidery before, but think I'll keep it in mind for the future! they're right -- 'kid' refers to soft leather, often from that of a young goat. Kid is often used in Goldwork and sometimes in stumpwork as well. It's a lot of fun to use and once you get the hang of it, it goes quite quickly. You can find Kid at Alison Cole Embroidery and Jane Nicholas Embroidery as well. I'm not sure where you can find it in the states. I love the red you're using, it's so bright and looks fantastic on the fabric. Thanks for sharing this with us. 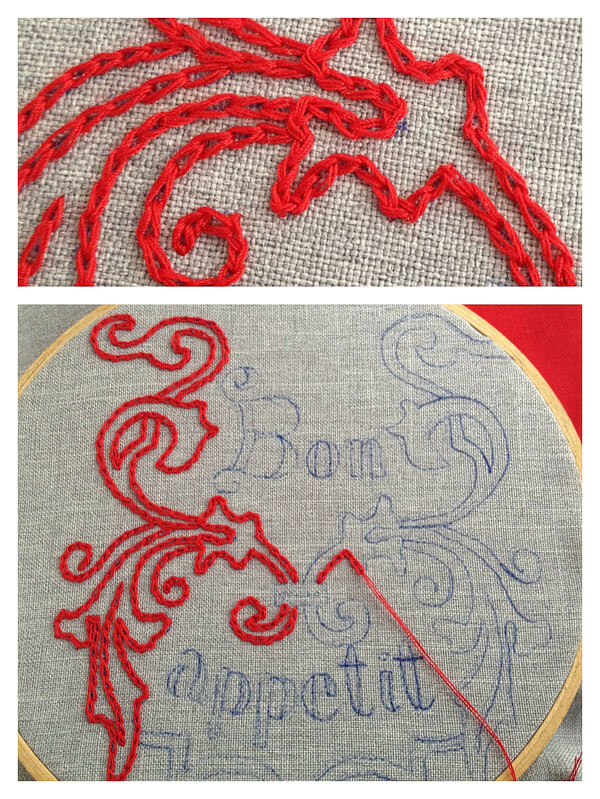 That red chain stitch is really striking on the grey fabric, and the stitches are inspiringly perfect. :) Looking forward to the next part!